Puddings,Souffles ,Custard…I love them all.There is something about these that makes me go weak in the knees.I am not such a big fan of these though,it is just the whole process of making it and waiting for it to set and then serving them chilled that thrills me..umm,no I am not crazy,if that is what you are thinking;-). As Nigella says,some recipes sing to you and sang it did..when I saw Mallika of Veg Bowl’s recipe for Coffee Biscuit pudding,I knew I am gonna love it.I always stick to ma-in-law’s classic recipe for Biscuit pudding,but this was different.It used Krack-jack biscuits and coffee and custard and it sounded like such a great combination that I HAD to try it. I absolutely love the burst of flavors in this.The slight tinge of salty taste mixed with coffee flavored biscuit layers with the custard sauce..just one word-awesome!! Mix custard powder with ¼ cup cold milk and boil the rest of the milk with sugar. Add the custard paste when the milk boils,stir for a while till it starts thickening and leave to cool until just warm. Layer the base of the pudding bowl with coffee soaked biscuits. Spread a layer of custard over this. On top of that again layer coffee soaked biscuits and then custard. Top with grated chocolate or cocoa and set in the refrigerator to chill for 3-4 hours. Garnish with dry fruits or nuts. Wow, it looks so yummy !!! Such a creative idea !!! I remember seeing in her place, but never made or taste this kind of fun pudding! Coffee quiet an excellent flavor! i may sound really stupid but whats a coffee decoction? Zeb,coffee decoction is nothing but strong coffee.You could also use instant coffee powder and mix with half a cup of hot water to make coffee decoction for this pudding.Hope this clears your doubt!! That pudding just looks so so yumm. Drool. Irresistible pudding, makes me drool..
Ohh this pudding looks delicious!! Wish I had some! Wowwwwwwww... wonderful presentation.. Awesome job!! Sluuuurrrrp!! !Just came back from MAllikas webpage...Gosh, I jjust love these kinda puddings...Bookmarked....cant wait to try...Divya, u will make me reeeeeeeeeeeeeeeeeeeeaaal fat:).. Yummy!! Mallika sure has some awesome desserts on her blog!! I have quite a collection of pudding at my space too. Check it if you have time. I love the sound of this, looks delicious ! Wow very nicely presented.Simple yet elegant dessert.Thanks to you and Mallika for sharing such a wonderful recipe. Looks yummy.. I guess this is kind of similar to the biscuit pudding you have as the main ingredient in custard powder is corn-flour, so it is similar..
WOW! I had fallen in love with Mallika's version when she posted it, and now yours! :)Looks delicious! First time on to ur space.. You have a wonderful blog.. 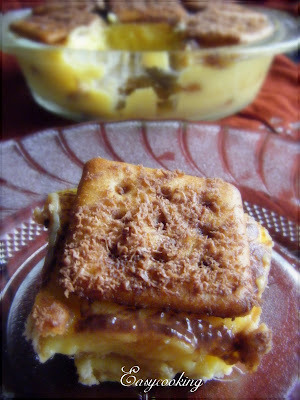 Delicious pudding, reminds me of a tiramisu, except lighter! 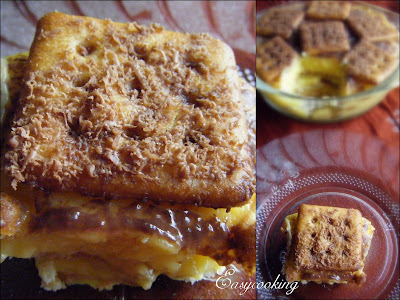 Yummmy...yummmy...I had recently seen it at mallika's place and have bookmarked the recipe now. Hey Divya, coming here after quite some time now. Surprised! Thanks for trying my recipe. I am glad u liked it :) This is one of my never-fail recipe and I rely on it in many occasions :) Nice clicks too. I am also eagerly waiting for ur trio-some recipes from Sweet Punch. 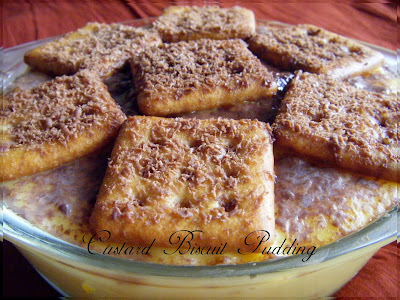 custard pudding sounds great..will try this..
Hi Divya - I tried this out today. However, I didn't use KrackJack biscuits as I normally don't eat those. Instead, I had a few animal crackers left and made the dish with that. It turned out great. I will post the photo later on my online album in FB. Thanks! Introducing - A Sweet Punch..one at a time!! The Best Chocolate Cake Event Round-up! !